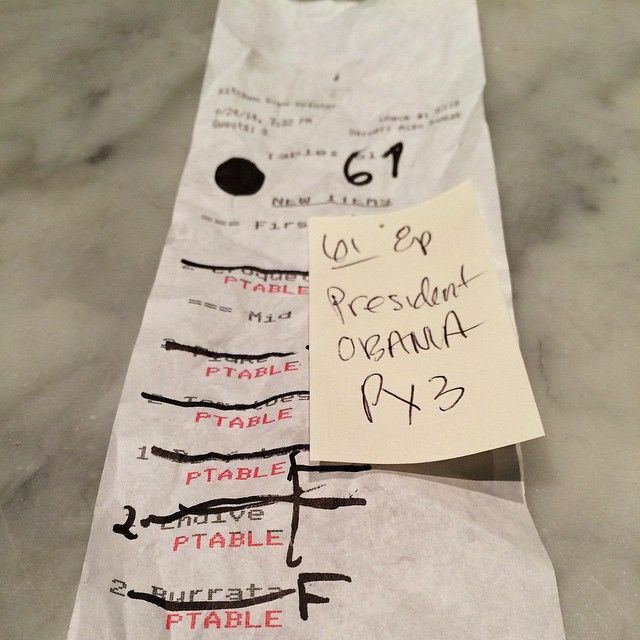 We all know by now that President Obama has great taste in food, but it’s nonetheless surprising that he and the First Lady chose to have dinner last night at the tiny and acclaimed restaurant Estela on East Houston Street. It’s unclear if partner Thomas Carter got to steer the Obamas toward any particular glass of biodynamic wine, but after yesterday’s “latte salute” debacle, the president was likely looking for a solid drink. Food-wise, it seems as though Ignacio Mattos served the couple fluke carpaccio, endive and walnut salad, cod croquettes, and some burrata. In other words, good choices. Here are some photos from the scene, including one from the restaurant itself with a run-down of what the couple ate. Here's a look at the scene inside. The restaurant is regularly pretty cozy, so conditions must have felt even tighter last night. Here's a closer look at what they ate, with each course crossed off by the kitchen after it was delivered.